The FRIGIDAIRE FAQG7017KR is a stylish, Classic Red gas dryer with a large capacity of 7.0 cubic feet. This product is not only attractive and spacious but it is also capable of killing most of the bacteria found in garments. In recognition of this capability, this dryer has been awarded with the NSF certification. The NSF certification assures the buyers that the product is concerned about the health of its consumers. The FRIGIDAIRE FAQG7017KR comes with such a certification mainly because it has a Sanitize temperature level, which is a level hot enough to kill 99.9% or nearly a hundred percent of bacteria. The FRIGIDAIRE FAQG7017KR comes with 7 drying cycles and 12 options, from which the user can choose when customizing the settings for a particular load. The settings chosen when used are automatically saved. So, the next time the user turns on the appliance, he can choose the last combination of settings. The Electronic Moisture Sensor should be able to detect the amount of moisture that can be found in a load. This way, the dryer can continue applying heat to the load while there is still moisture. The drying intensity and duration will depend on the dryness level of the load and the dryness level the user requires of the load. Quiet operation is made possible by SilentDesign technology. The FRIGIDAIRE FAQG7017KRís door is strong, durable and electronically locked. Because of the Control Lock feature, it can only be opened when the cycle is finished. The door is made of durable materials. The drum is made of painted steel. It has a large capacity, making way for 7.0 cubic feetís worth of laundry to be dried. It also has an interior light that enables the user to see if there are still garments left in there. 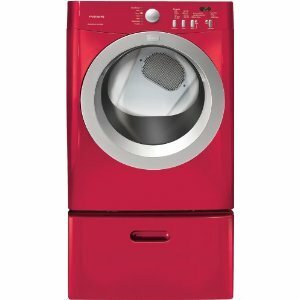 The main color of a dryer with this particular set of features is Classic Red. However, the same gas dryer is also being sold in Classic White. Both avant-garde and traditional prospective buyers will have a color to pick. The FRIGIDAIRE FAQG7017KR has Express Select controls. Express select, in this case, means that the user can just press a button to make a selection. He can just press a button, for example, to start, pause or stop a cycle. The gas dryer is pretty easy to use. As mentioned earlier, the FRIGIDAIRE FAQG7017KR is easy to use partly due to its Express Select Controls. The product is NSF certified, ensuring the destruction of harmful bacteria from the garments. With 7 drying cycles and 12 options, the FRIGIDAIRE FAQG7017KR can be programmed to fit a loadís needs. Technologies that promote thorough dryness, cleanliness and wrinkle-free garments are combined in this product. The dryer is not ADA compliant.